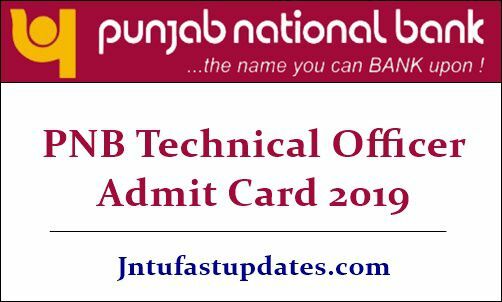 PNB Technical Officer Admit Card 2019: Punjab National Bank (PNB) has all set to conduct the technical officer written test on 24th March 2019. The examination is going to be conducted in many examination centers across the nation. All the applicants must get ready to attend the examination. As per the information revealed by PNB, the competition is severed for the announced posts. Hence all the hopefuls must prepare well to crack the examination. Before going to attend the written test round aspirants must download PNB Technical Officer hall ticket 2019 from PNB official portal, pnbindia.in. The hall ticket/admit card is the most important document to carry to the examination. The examination invigilators will allow the candidate to proceed with the test only after verifying the hall tickets. Hence the hopefuls must carry PNB Technical Officer admit card without fail while going to the examination. Soon, the download link will be activated on the PNB website. Aspirants applied for technical officer posts can stay checking the portal for latest updates. Punjab National Bank (PNB) recently advertised 325 posts to hire suitable aspirants into various posts. PNB announced Senior Manager, Manager, and Officer Jobs. Many of the hopefuls wishing to get bank jobs and having suitable eligibility have applied for PNB Posts during the application dates. PNB received a large number of applications from across the nation. Screening of aspirants will be done through written test and interview rounds. Candidates have to perform well in both the rounds to get shortlisted for the announced posts. Candidates finally shortlisted for the PNB Technical officer and other posts will get a good pay scale and intensives as per the norms. All the hopefuls applied for Punjab National Bank posts will have to give the preliminary examination as per the scheduled dates. Candidates must download the hall tickets as a must to attend the written test. The hall ticket will be accessible to download from the PNB official website, pnbindia.in. The hall ticket might release before 10 days of the examination date [tentatively]. Hence the hopefuls applied for PNB Technical officer posts can stay checking the PNB website to download the hall ticket. Hopefuls must carry both their hall ticket along with the identity card to attend the examination without any disturbances. Reach the examination centers before 30 minutes of the examination. Late candidates will not be allowed to the examination. And check all the examination guidelines clearly from the hall tickets once after downloading and proceed accordingly. Search the PNB Technical officer Hall Ticket download link in organization website. Check the information in PNB Technical officer Hall Ticket 2019.